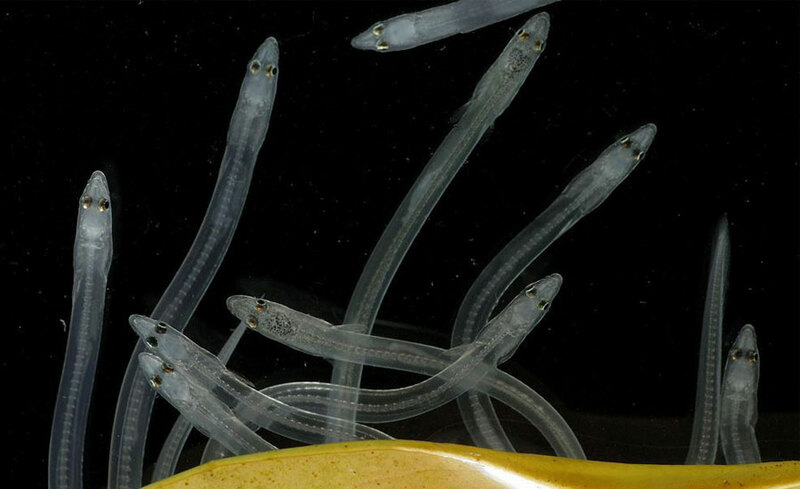 Flat and transparent larva of eels are called as Leptocephalus (slim head). Fishes with a leptocephalus larval stage include the most familiar eels such as the conger, moray eel, and garden eel as well as members of the family Anguillidae. Glass eel is a developmental stage from the end of metamorphosis in the leptocephalus to the beginning of pigmentation. Leptocephalus larva undergoes metamorphosis and enters a stage called as glass eels, before entering freshwater. It has the shape of an adult eel, with small size and without any pigmentation. Following this stage the young eels are called “elvers”. You may be interested in Whale Falls and Whale fall communities.